Of all the reasons the Volvo S60 Dynamic is recognized as a popular compact luxury sedan, the different trim features are really turning heads. The reason you can see the Volvo S60 Dynamic coming from a distance is because of the Active Dual Xenon headlights. These headlights make it easier for the driver to be able to navigate the roads in various weather conditions. Additionally, these headlights are crafted to be able to allow other drivers to spot you on the highway. The Volvo S60 Dynamic has an interior trim design that really makes it stand out from the crowd. It is hard not to see the bright metal with unique geometric patterns that give off the three-dimensional effect drivers love. The addition of a satin finish makes the pattern really pop too. 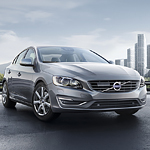 If you want to take the Volvo S60 Dynamic for a test drive, stop by Volvo Cars of Evansville today.